Next month we are excited to have Jeff Miller in our classroom teaching a 2-day demonstration seminar on Designing and Building Chairs from November 2-3, 2013. You can find out more about the class and sign up HERE. I teach a lot of classes on designing and/or building chairs; a topic that many people approach with some trepidation. But it’s not that chairs are by nature extraordinarily difficult; it’s that many of the elements of chair design and building seem so foreign. For example, when we explore chair comfort in a class, students often have to learn to think about what makes a comfortable chair. We sit in so many chairs (and so many of them are not comfortable) that we often ignore the issue altogether. Is the chair you’re sitting in now comfortable? Have you thought much about this before? Have you ever sat in a really comfortable chair? One that made you notice how uncomfortable all the other chairs you usually sit in are? This is where I start designing my chairs, and where I start teaching about chairs as well. The same sorts of questions go into the appearance of a chair. Much of what I do consists of keeping my eyes open to visual elements that really intrigue me. And certainly one element that is fairly consistent in my designs is a curve (or curves) that are generated by observing the human form. In other words, a comfortable curve can also be a very interesting curve visually. And this tends to make for a really good foundation for the design, wherever it goes. There’s no doubt that building chairs pose challenges. There are usually curves and angles to deal with, often in combination. But as with everything else, a little bit of “eye-opening” lets you see that the challenges are much more manageable than they might seem. The best example of this comes up when dealing with angles. Much of the complexity in cutting angled joints is in your head. Learning how to figure out the angles you need, and then how to cut the joints as if they were in a simple rectangular piece of wood makes all the difference. Of course, I’ve got plenty of techniques, tips and tricks accumulated over three decades of chairmaking to help you through all of the various stages in making a chair. Join me on November 2nd and 3rd as we explore designing and building chairs. 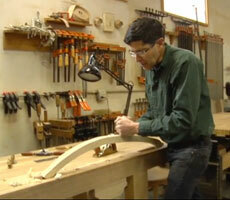 I’ll discuss and demonstrate numerous eye-opening approaches to designing and building a successful chair. ———————————————————————————————————————————————————–*Jeff Miller is a furniture designer, craftsman, teacher, and author of woodworking books and articles (he’s also a former classical musician, and a dad). Jeff’s furniture has been shown in galleries and shows nationwide, and has won numerous awards. His furniture is in the Decorative Arts Collection of the Chicago History Museum. Product Tour: Oneway Wolverine Grinding Jig The October episode of The Highland Woodworker is here!